This executive summary provides the rationale for and summary of the articles of this Special Edition of the Journal of Agricultural and Food Industrial Organization. This article is published as Bruce, A.S., J.M. Crespi and J.L. Lusk. 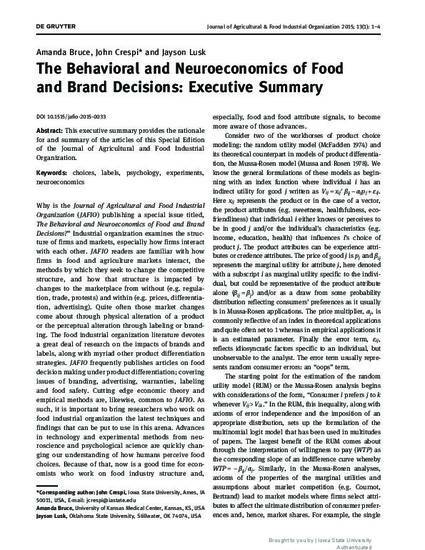 “The Behavioral and Neuroeconomics of Food and Brand Decisions: Executive Summary.” Journal of Agricultural & Food Industrial Organization 2015; 13(1); 1-4. DOI: 10.1515/jafio-2015-0033. Posted with permission.